THE ROCKET SUMMER has announced a special U.K. run of shows with his band celebrating the 10 year anniversary of their breakthrough album DO YOU FEEL. This follows a successful full U.S. Do You Feel 10th-anniversary tour that they embarked on this summer. The run of shows begins 30 October in Bristol at Fleece and concludes 6 November in London at The 02 Islington. Sometimes, to see how far you’ve come, you have to look back at your beginnings. 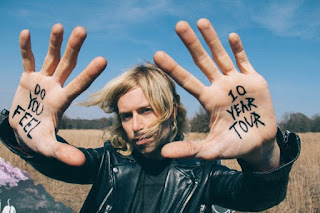 For multi-instrumentalist, BRYCE AVARY of The Rocket Summer, his evolution into the powerpop/indie rock powerhouse that he is becoming has origins in his dynamic and explosive entrance into the mainstream ten years ago with his breakthrough album DO YOU FEEL. Before he embarks into his evolution forward, Avary will be stepping out of the studio where he is working on new music to celebrate the 10 year anniversary of a special album for TRS fans by performing the album for the first time ever in its entirety. Celebrating the album which earned them the cover of Alternative Press who hailed him as “merging Cheap Trick’s hard pop hooks with Dashboard Confessional’s earnestness”, Avary will be playing Do You Feel along with an additional set of fan favorites from Hello, Good Friend, Of Men and Angels, Calendar Days, Life Will Write The Words, and Zoetic and spiking it with some brand new material that he's working on. Check out the dates below and be sure to catch The Rocket Summer’s UK Do You Feel 10 Year Tour when it comes to a city near you!